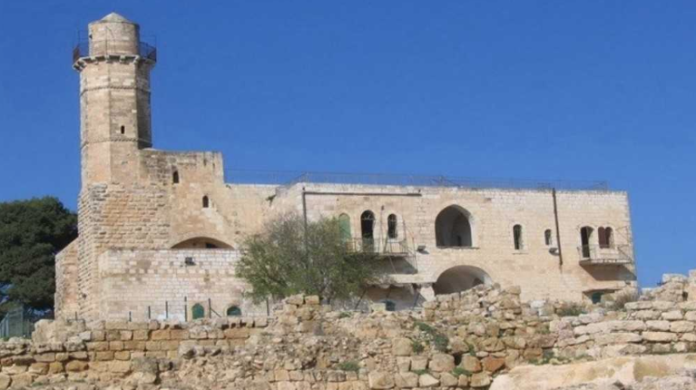 Arab residents of the village Nabi Samuel have seized control of the Tomb of the Prophet Shmuel (Samuel) and the nearby archaeological site, and have begun to pave a new and illegal parking lot while destroying valued archeological findings. The Tomb of the Prophet Samuel, near the northern Jerusalem neighborhoods of Givat Zeev and Ramot under full Israeli jurisdiction, is considered a holy site by all three major faiths. Hundreds of thousands of worshippers, researchers and tourists visit the site annually. The area was declared a national heritage site and the rich archaeological remnants dating back to the First Temple era, as well as the ancient oak trees that cover the hilltop, are all protected by National Park status. Arab residents of the nearby village Nabi Samuel have recently broken into the archaeological garden and used heavy machinery to pave a large plot, apparently the first stage in creating a parking lot, as a means of collecting parking fees from visitors to the site. Regavim, a research-based legal advocacy NGO dedicated to ensuring accountable use of Israel’s national land, documented the illegal work being carried out at the site and issued an urgent request to the IDF’s Civil Administration, the body responsible for law enforcement in Area C, demanding that the work be stopped immediately.